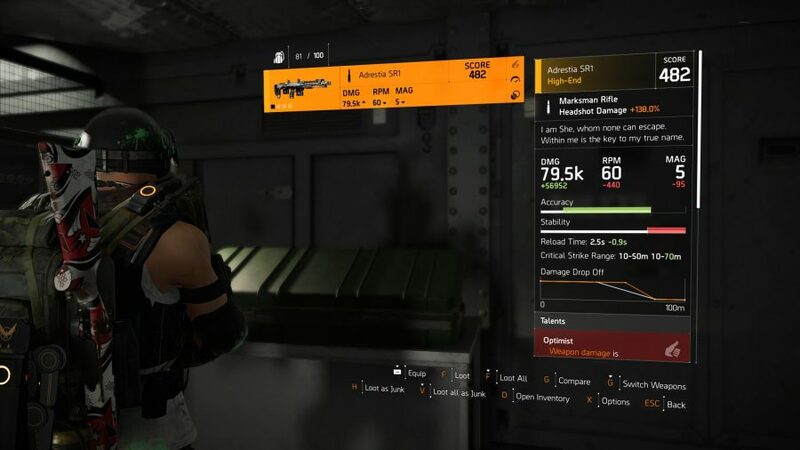 Want to know how to get The Division 2 Nemesis marksman rifle? After a couple of weeks waiting for the right invasions to occur, players can finally craft their first Division 2 Exotic sniper rifle. The Nemesis requires four bespoke Exotic parts and Puck’s Nemesis Blueprint in order for you to craft it, and getting each and every component is tiring work. This is especially tricky as each part is locked behind a different invaded mission or stronghold, which rotate each week. That means you can’t just grind for this lethal weapon in a single session. To balance that out, the Nemesis boasts the highest damage per shot of any gun in the game and has a few neat talents, such as tracking targets and charged shots. Word to the wise: you will need to be at the higher end of World Tier 4 before you can start unlocking pieces for this sniper as you’ll need access to the Black Tusk Stronghold Tidal Basin. 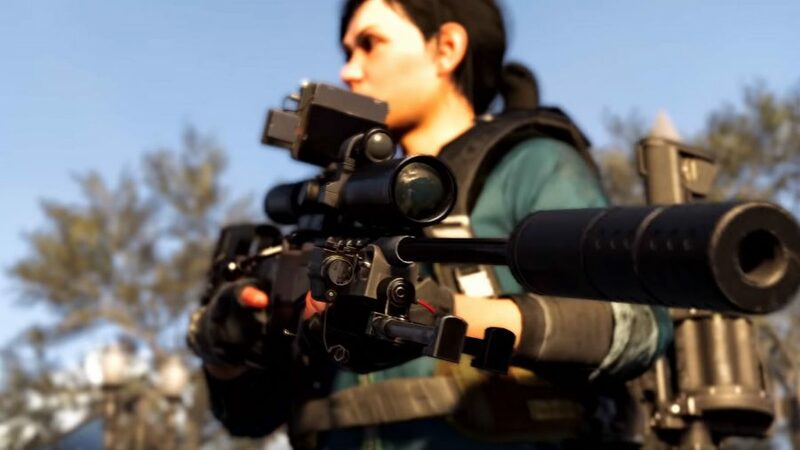 Here’s how to get The Division 2 Nemesis Exotic sniper rifle. The talents for the Exotic sniper rifle are very promising, and as it appears to roll with some very high damage this sniper rifle should see a lot more use than the Pestilence. Here are the talents for The Division 2 Nemesis Exotic. These talents sound incredible, especially after the lacklustre talents that adorn the Pestilence LMG. The Holstered talent, Preparation, will also allow for a lot more Division 2 PvP build diversity players can stack headhsot buffs onto other weapons more easily, potentially creating one or two-hit rifle, assault rifle, or LMG builds. The tracking ability also sounds very powerful in PvP, and its damage buff will help in all areas of the game. The first thing you need to do is run the Tidal Basin stronghold, which is available at Gear Score 425 in World Tier 4. You’ll need to complete this in order to get to World Tier 5 – fortunately, we have a Tidal Basin walkthrough you can check out if you’re stuck. Once you’ve done this you’ll need to unlock the Tidal Basin again by ticking off a couple of invaded missions and the next invaded stronghold. Doing this will make the Tidal Basin stronghold available again, so start a second run through. When you reach a small compound with a comms building and a laptop you need to interact with, head upstairs and investigate the cots where you should find a bright yellow key that you can pick up. Continue on your way until you reach the giant Black Tusk hovercraft itself, fight through the main hangar, and then pause as you reach the gantry opposite the entrance you came through. The mission will send you out the right-hand door, but if you look to the left you can spot a closed door with a keypad by it. Interact with it and open up the weapon case inside the room, which drops a high-end sniper rifle called the Adrestia SR1. This sounds mad, but you’ll want to deconstruct this immediately, which should grant you the Exotic component: Marksman Rifle: Scope – The Tally. Read the description of this component and the rest of the steps should become pretty clear as Klutz, Shorty, and Prime are the names of the invaded bosses in the other strongholds. Hover your cursor over this stronghold on the in-game map and you’ll note the final boss is David “Prime” Maxwell, so it’s pretty clear that you’ll need to kill him to get the next part. 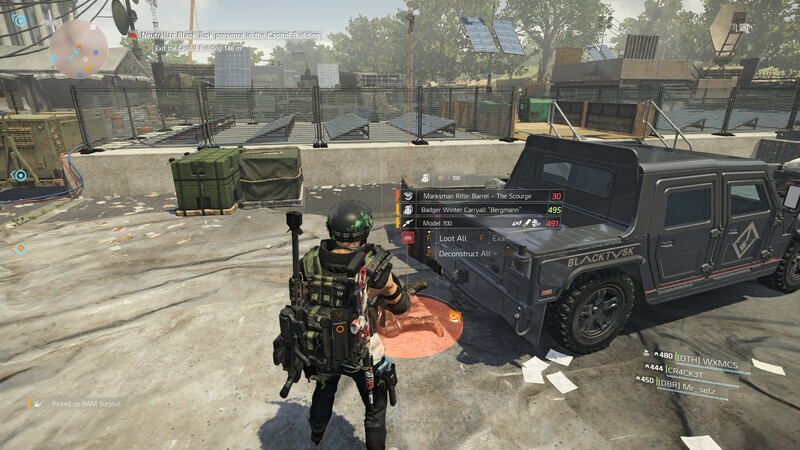 Complete the invaded Capitol Building stronghold (you can toggle this by pressing G when moused over the stronghold in your map) and you should get the next component for The Division 2 Nemesis Exotic sniper rifle: Marksman Rifle: Barrel – The Scourge. You’ll need to complete this in its invaded form to get Shorty’s Exotic sniper rifle component. Same as above, just kill the invaded stronghold’s final boss. When you have all of the pieces, you just need to grab the Nemesis blueprint (see below) and you should be able to craft the Exotic at your crafting bench in the Base of Operations. So the final piece is the Nemesis blueprint, which you can get by killing Puck in the invaded version of the Grand Washington Hotel mission. You don’t need to complete the mission, you just need to kill Puck. The drop rate does not appear to be 100%, just retry if it doesn’t drop.